In the 1923 World Series, the New York Yankees beat the New York Giants in six games. This would be the first of the Yankees' 27 World Series championships (as of 2009). The home field alternated each game, a noted difference to the 2–3–2 format. The Yankees opened their new Yankee Stadium in April on a home run by Babe Ruth, setting the tone for the season and this Series, in which Ruth hit three home runs along with drawing eight walks. In Game 2, second baseman, Aaron Ward hit a home run. The Giants' one bright spot was "Old Casey" Stengel, who hit game-winning homers in each of the two Giants' victories. In typically eccentric Stengel fashion, one of them was inside-the-park at the cavernous Yankee Stadium, and his shoe came loose during his run around the bases. Stengel was traded after the season, leading him to quip later in life, "It's a good thing I didn't hit three homers in three games, or McGraw would have traded me to the Three-I League!". A quarter century later, Stengel would take on the role of Yankees manager, and would guide the Bronx Bombers through one of their most successful eras. The three consecutive matchups between the Yankees and Giants (1921–1923) marked the only time (as of 2009), that three straight World Series featured the same two clubs. Thanks to the large seating capacity of the new Yankee Stadium, coupled with expansion of the Polo Grounds the same year, the 1923 Series was the first to eclipse 300,000 in total attendance (301,430), averaging over 50,000 per game (50,238), with gate receipts over $1 million dollars ($1,063,815.00). This was the third time that a team had inaugurated a new stadium with a World Series win, and would be the last until the St. Louis Cardinals victory in their new ballpark in 2006. Neither Lou Gehrig, Bill Terry nor Hack Wilson played in the Series. These future Hall of Famers were each in their first season and had played no more than thirteen games in the regular season. 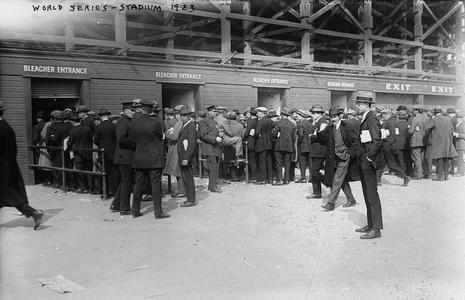 The term home field advantage took on a whole new meaning in 1923 as baseball's grand cathedral, Yankees Stadium, opened much to the dismay of the Giants. Although the two-time defending champions would finally reclaim the Polo Grounds for themselves, The House That Ruth Built towered over their yard and featured an enormous seating capacity with an architectural beauty that was second to none. With the addition of a third ballpark, New York had established itself as THE premier city for professional sports entertainment. A sports columnist from Philadelphia had written that thousands of years in the future archeologists would uncover ruins in the lower Bronx that would resemble that of ancient Rome's coliseums. The Giants had generously shared their field with the Yankees (and Highlanders) since 1913 but now found themselves standing in the shadow of their cross-town rivals. Although the Yankees had lost two consecutive World Series to the Giants, they were quickly becoming the more popular of the two. The soon to be penned Bronx Bombers boasted the game's top player, the largest arena, and the best record in baseball after winning their third American League pennant by a sixteen game margin. Once again, the Subway Series was on as the Yankees and the Giants met for the third consecutive year. In a strange twist, Giants' outfielder, Casey Stengel, who would later become one of the most successful and beloved Yankee managers, beat his future team in Game 1 with an inside-the-park home run off of Joe Bush to break a 4-4 tie in the ninth. The Yankees were now winless (eight losses and one tie) in Series games against the Giants, but New York had Babe Ruth and he would have something to say about that. After a disappointing season plagued with suspensions and poor play in 1922, the Babe was back in action, hitting .394 and sharing the home run title with the Phillies' Cy Williams (with forty-one). He was in top form for Game 2, hitting home runs in the fourth and fifth innings on the way to a 4-2 victory at the Polo Grounds. Game 1 hero Casey Stengel once again stole the spotlight in Game 3. Through six innings, the Yankees' Sam Jones and the Giants' Art Nehf were locked in a scoreless battle. Then, with one out in the seventh, Stengel homered into the right field stands at Yankee Stadium for the win. Not to be outdone, the Yankees dominated the next two outings while totaling sixteen runs with twenty-seven hits resulting in 8-4 and 8-1 victories. New York coasted through Games 4 and 5 on the arm of Joe Bush and the bat of Joe Dugan. Finally, the Yankees had beaten the Giants for their first world championship in their brand new stadium (which featured crowds in excess of 62,000 and over $1million dollars in ticket sales). In addition, Babe Ruth had finally beaten his post-season demons, hitting three home runs, a triple, a double and two singles while batting .368.